An X-ray image of the supernova in Messier 82, created with data from NASA's Chandra X-ray Observatory. When a supernova suddenly appeared in the night sky earlier this year, astronomers scrambled to study the bright new object before it faded away. 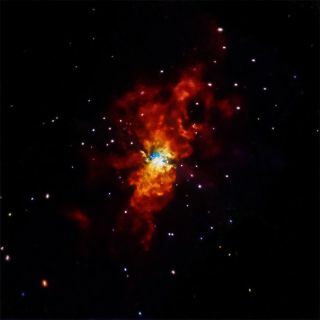 Now, with new forensic data gathered by NASA telescopes, scientists say they have a better idea about what caused the star explosion in the nearby Messier 82 galaxy. A group of astronomers looked for an X-ray source around the supernova in Messier 82, also known as the Cigar Galaxy, using NASA's Swift telescope and Chandra X-ray Observatory. But their search turned up quite empty. Compared with older data gathered around the region, there were no new X-rays present after the supernova. "While it may sound a bit odd, we actually learned a great deal about this supernova by detecting absolutely nothing," study leader Raffaella Margutti of the Harvard-Smithsonian Center for Astrophysics (CfA) in Cambridge, Massachusetts, said in a statement from NASA. "Now we can essentially rule out that the explosion was caused by a white dwarf continuously pulling material from a companion star." Margutti and colleagues say more work is still needed to confirm how the supernova named SN 2014J was triggered. Scientists studying the history of the universe are especially interested in Type Ia supernovas. Because these objects always release the same amount of radiation at their peaks, astronomers can use Type Ia supernovas as cosmic distance-markers. These star explosions even played a central role in discovery that the universe is expanding at an accelerating pace. "It's crucial that we understand exactly how these stars explode because so much is riding on our observations of them for cosmology," study researcher Jerod Parrent, also of CfA, said in a statement. "SN 2014J might be a chance of a lifetime to study one of these supernovas in detail as it happens." The study is included in the July 20 print issue of The Astrophysical Journal. The full text of the paper is free to read online at the preprint service arxiv.org.